The 2nd part doesn't seem to work. Don't the permissions work like that? Any help would be appreciated. Your current policy would work in the AWS-CLI, e.g. aws ec2 stop-instance should work. However to actually use the web console you need a few more read-only permissions because the console tries to list and describe all the instances to build the list. 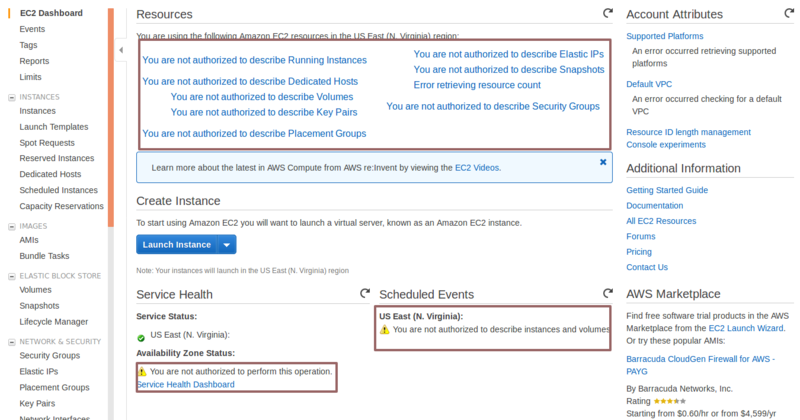 You may need at least ec2:DescribeInstances to get a basic half-broken list. If you only care about preventing that IAM user from modifying other instances you can give him a read-only access with ec2:Describe* - that should make the console usable while preventing him from modifying any non-permitted instances. I'm not aware of a way to restrict the listing of instances only to the one he can work with, he will probably see them all but can only manage that single one. You have to deny all, but in your condition, use ArnNotEquals "arn:aws:ec2:us-east-1:123456789012:instance/i-0123456789abcdef"
This will basically deny all other instance that does not have the same ARN as the instance that you want to be allowed. Thank you MLu and Sharuzzaman Ahmat Raslan! First, need to make sure the right policy is attached to the user group or in my case, the right policy is detached. The user had no EC2 access. Hope this helps someone stuck to save some time. This cannot be done using IAM policies. The ec2:Describe* commands (including ec2:DescribeInstances) do not support resource-level permissions. So you can only allow or deny ec2:Describe* for everything (*). So your user can see all instances, or none. The order of the policy statements does not change the result of the policy. So don't try to write or interpret it "top down". So once you have a "Deny" statement, nothing can override that. How to restrict IAM policy to not allow stop/terminate an EC2 instance but can create new instances?